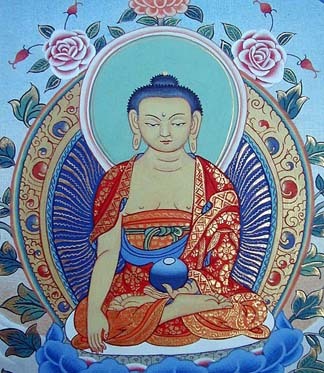 Shakyamuni is the historical Buddha. Around 500 BC he was born Gautama Siddhartha, a “prince” in what is now Nepal. Shakyamuni is represented as having a golden color, sitting on a lotus disk, in the lotus position, wearing the robes of a monk, with no ornaments. His left hand is in the Dhyana or meditation mudra, holding a begging bowl. His right hand is shown in the Bhumisparsa mudra. This ground touching represents the earth bearing witness to the fact that Gautama has become enlightened and is in fact the Buddha. 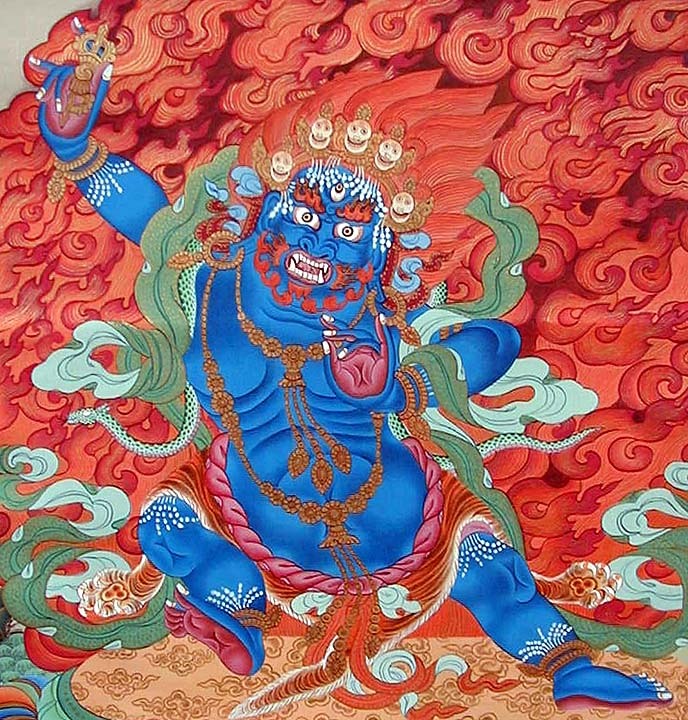 The name Shakyamuni means the Sage of the Shakya Clan. This design depicts some of the important events and myths in the life of the Buddha. 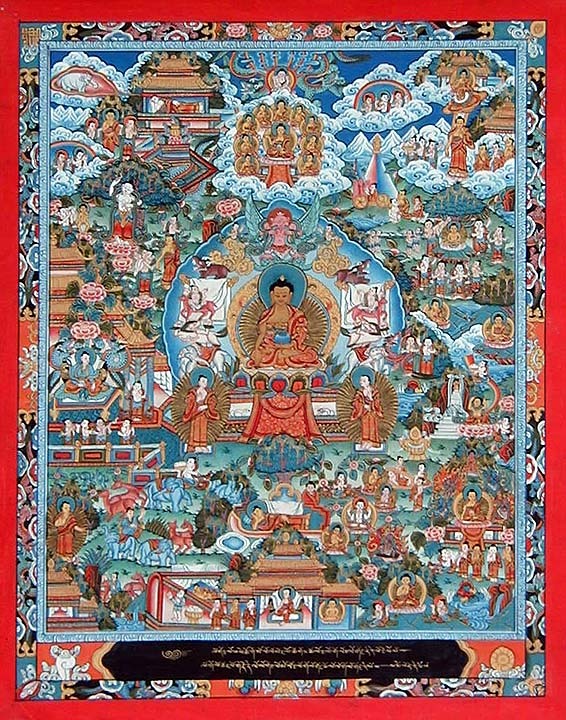 Shakyamuni occupies the center. Some of the events around him are, Maya, Buddha's mother, dreaming of a white elephant, in the upper left corner. 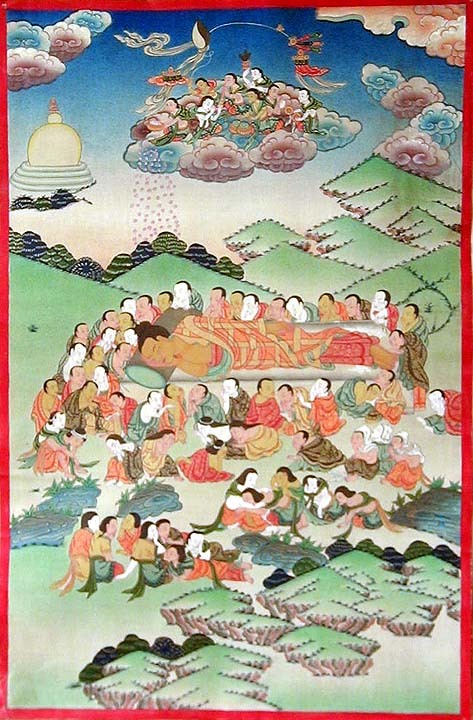 This is the moment of the Buddha's conception. Below Maya is shown standing, holding the bow of a tree, giving birth, attended to by various Hindu goddesses. Shakyamuni lived behind the walls of his palace for the first twenty-seven years of his life, protected from the realities of life. 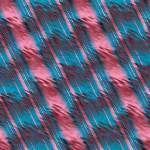 Then he persuaded one of his father’s charioteers to take him beyond the palace walls. There he saw an old man, a corpse, and a leper. This made him realize that life was short and rude. Shortly afterwards he left the palace, his wife and son, cut his hair, cast off his jewelry to live as an aesthetic. Buddha is shown starving himself, taming a drunken elephant, reaching enlightenment, preaching his first sermon in the deer park, descending from heaven after preaching to his mother. At the age of eighty-three he died, this is what is shown as the reclining Buddha. 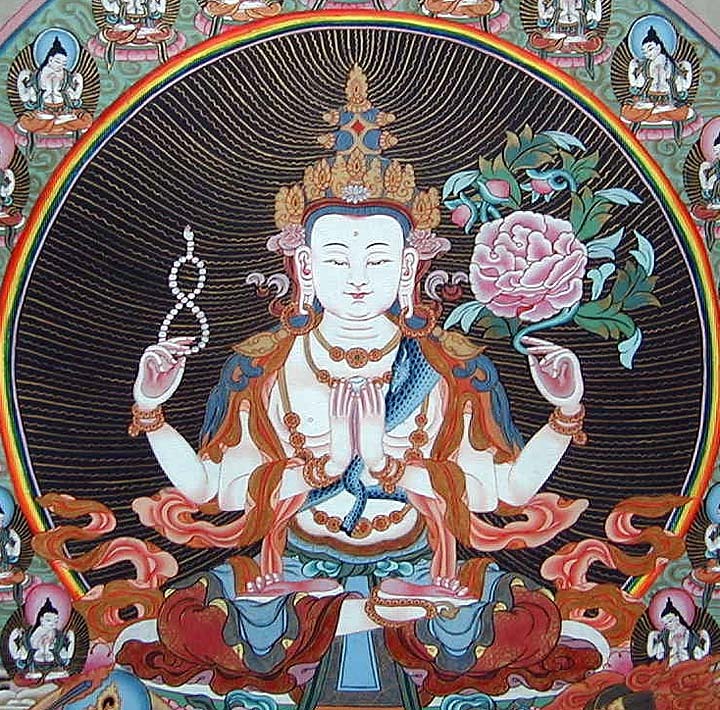 Queen Maya conceived the Buddha when she dreamt of the White Elephant left Tushita Heaven. She is shown as the central figure, surrounded by attendants holding fruits and a mirror. The golden baby Buddha is born from her side as she grasps a branch of a tree. 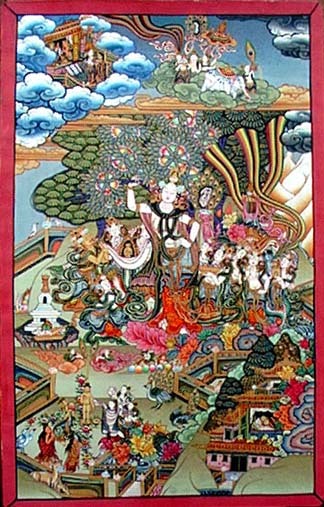 Indra, with three heads, receives the baby Buddha, who takes seven steps and declares his last birth. The reclining Buddha is the Buddha dying more than eighty years later. 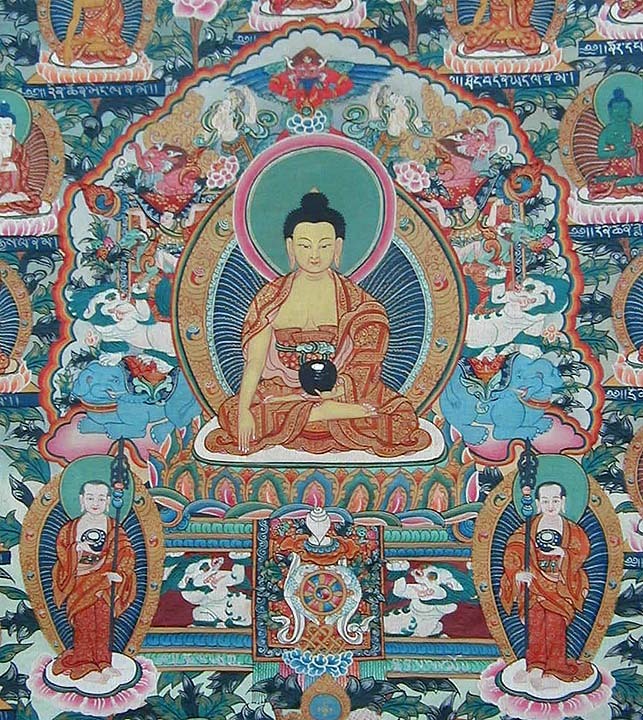 The Birth of the Buddha motif is often incorporated into the motif known as The Life of the Buddha. 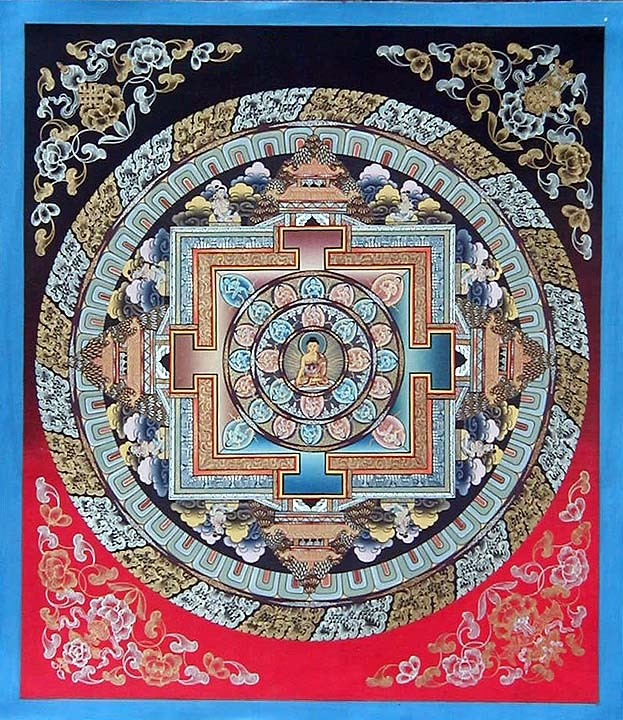 This design is usually shown within a larger "Life of the Buddha" painting. It shows the Buddha shortly after leaving his palace and casting off his jewlery. He is cutting his hair as he begins to practice austerities. died, this is shown as the reclining Buddha. Click icons below for more Gods.